I was raised on Nestle Toll House Chocolate Chip Cookies. They were the first things I learned to bake and have always been my go-to recipe when craving home made cookies. 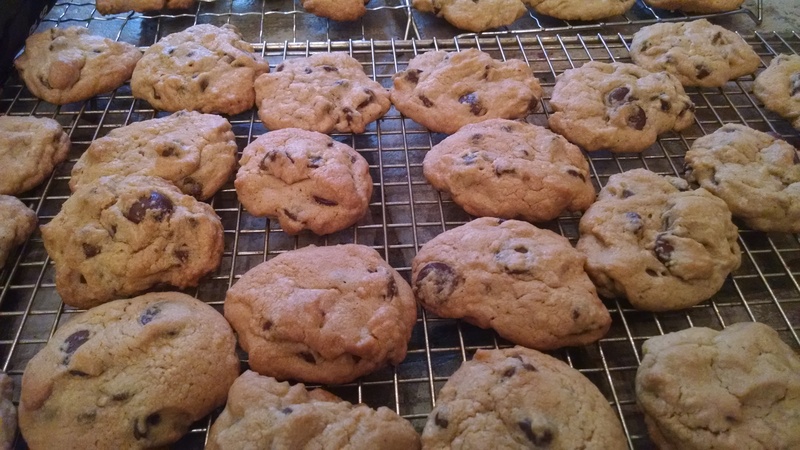 However, I did spend almost ten years in the San Francisco Bay Area and found that I really, really, REALLY liked the taste of Ghirardelli chocolate, though I continued to use the recipe from the back of the Toll House morsels for my cookies. This time, I used the recipe on the back of the Ghirardelli package of semi-sweet morsels. The only difference is less salt and more vanilla but because I use a Mexican vanilla with a hint of cinnamon, the little extra makes the cookies even better. I didn’t have enough granulated sugar for the recipe and really didn’t want to go to the store, so I pulled out my mortar and pestle to crush up enough sugar cubes to do the job! Stir flour with baking soda and salt; set aside. Beat butter with granulated sugar and brown sugar at medium speed until creamy. Add vanilla and eggs, one at a time, mixing well until incorporated. Gradually blend dry mixture into creamed mixture. Stir in chocolate chips and nuts, if desired. Drop by tablespoon onto ungreased cookie sheets. Bake for 9 to 11 minutes or until golden brown. I cooked them for 10 minutes, turning the cookie sheet midway through baking. Not on recipe but I cool on baking sheets for a couple minutes before removing to wire racks to cool completely. I fear to know! After living in the SF Bay Area for a while, I’m committed to Ghirardelli baking chips.